I had to leave that section of sewer pipe between the cabin and the septic tank above ground, because that’s where the outflow ditch from the gully behind the cabin just naturally has to go – at least without a lot of dirt work. Now I’m thinking maybe I should scrounge a piece of small culvert if possible, because burying the sewer pipe its whole length turns out to have previously unexplored advantages. 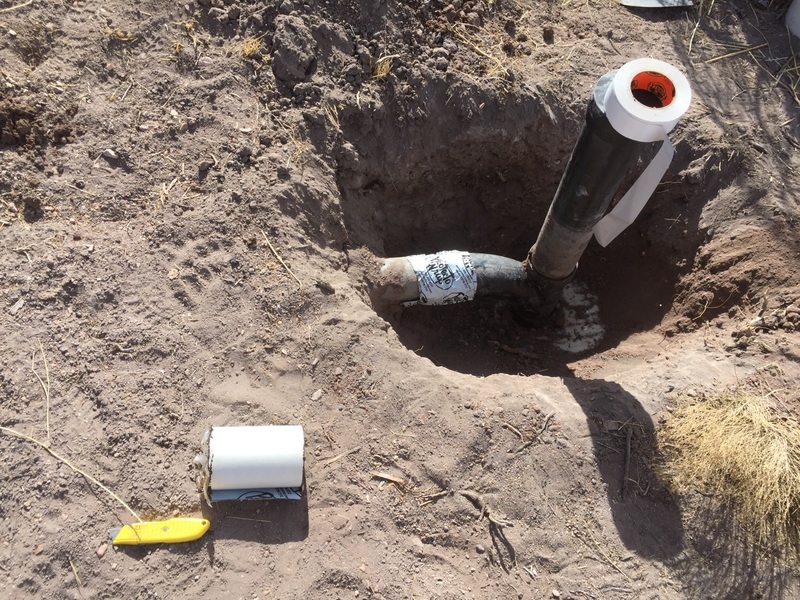 I scrounged all my sewer pipe back when I laid out the system in early 2011. This part just sort of flexed itself in two, which I didn’t know it could do. Look at the size of that gap! Once exposed it immediately began filling with dirt, which led me to wonder how much dirt was already inside. How could that have happened? I was quite prone to cut corners back then, before being thoroughly schooled in how easily the desert can tear apart even my best efforts. I very well may have put it together without cement. But I certainly didn’t build it with that gap. I definitely did cement the fitting to the tank, but the cement failed to bond to the plastic of the tank. As soon as I got it dug out, things got very wobbly. I had to work carefully to keep dirt out of the tank. …and I swear it looks like that pipe shrank 2-3 inches. Which as far as I know is definitely not the explanation. This development changed the game. I hoped to free things up enough to slip in a patch at the break I knew about. But now all that pipe needs to be replaced, from the cleanout (halfway between the cabin and the ditch) to the tank. That meant I couldn’t finish the job today. I can get the pipe locally, but not for maybe a week. Good news, that gives me time to dig even when I’m going through a bad-back period. Also good news: Thanks to TUAK readers, I have the money to buy the pipe. Even with the massive eye doctor appointment coming up in less than 2 weeks. Bad news: It’s either spend a week crapping on the Plan B chair, or do something redneck. Big Brother sent me this partial roll of “Protecto-Wrap,” which I think might be equivalent to something you guys were telling me about a few days ago. Took me a few minutes to figure it out, since the first part of the roll was dried out and had no adhesive qualities at all. But once I cut off the bad bit I could put a couple of wraps around the pipe and fitting, then finish it off with lots of heavy-duty Gorilla tape. It’ll either work, or make a really big mess in that hole.
. . . for a while. 🙂 That’s not the sort of thing I’d leave till summer. Having lived without one for an extended period, I like my flush toilet. Good (if temporary) job, Joel! Hell, “do something redneck” were on the instructions I came with. I repaired P-Trap under a sink with silicone caulking and silicone thread tape. It looks like a cast. Still holding two years later. Sometimes redneck works. 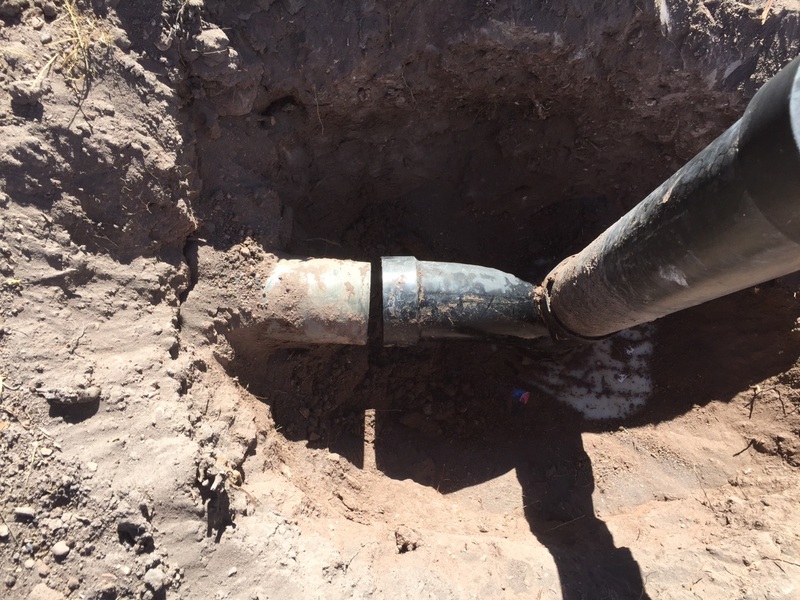 If that’s a flex point (unless there’s a ground shifting issue it shouldn’t be, but the pipe looks like it’s buried rather shallow, so maybe…) there is available a clamp-on sleeve – a rubber joint. As a permanent fix, I have no idea how much flex it’ll tolerate before failing, but maybe keeping one of the right size on hand for emergency repairs might not be a bad idea. 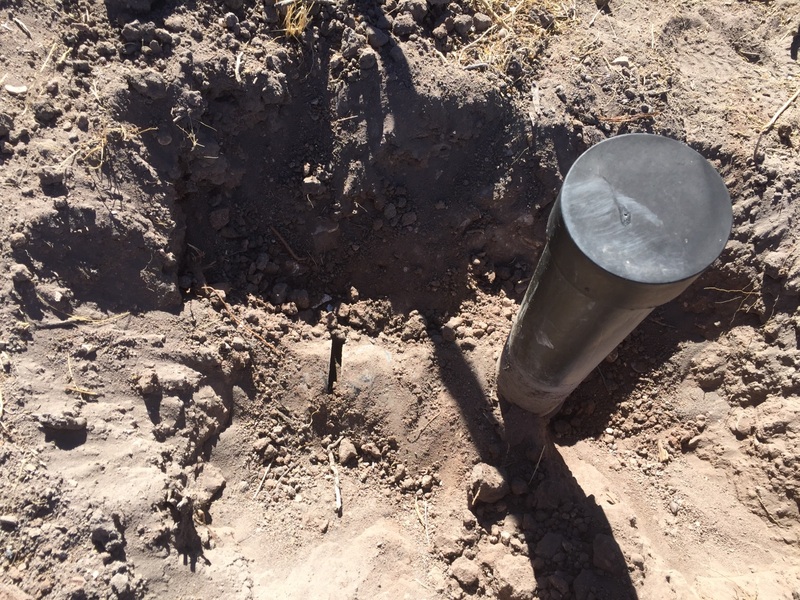 I have put miles of pvc in the ground and have never known the stuff to shrink. 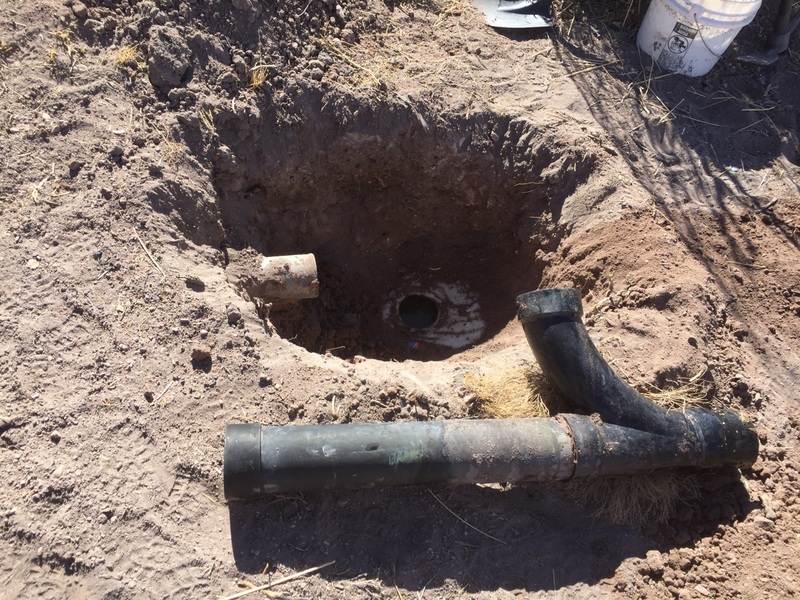 More likely the pipe was stepped on where it is exposed. Perhaps one of your bovine visitors? An alternative explanation is that Landlady’s land holdings are gradually expanding. Yeah, I wanted a couple of those flex couplings in the worst way to fix the original break. 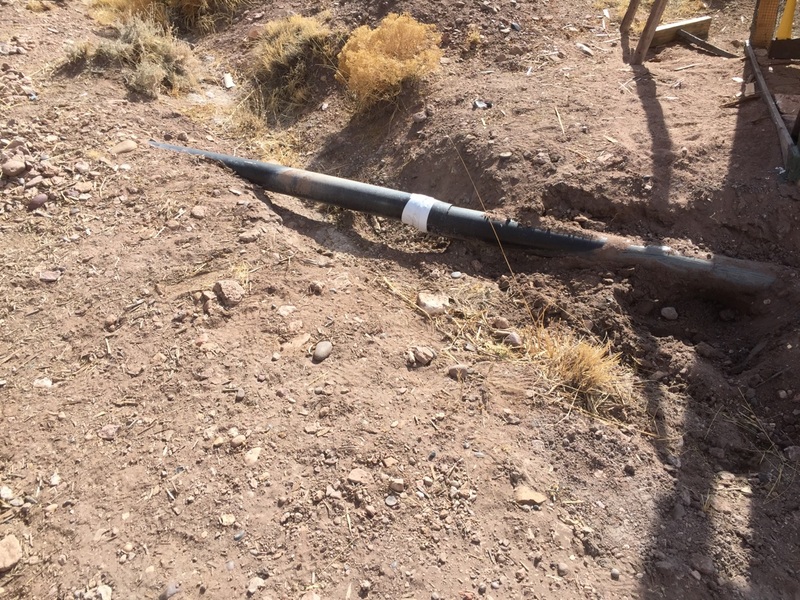 The local hardware store’s failure to carry them in 4″ is what caused yesterday’s excavation to be necessary. This is an example of why plumbers make good money. I was being groomed for the business but decided to go into electronics instead. Silly me. CANNOT THE LOCAL STORE ORDER THE 4 INCH FOR YOU? DON’T THEY WANT YOUR MONEY? Sure they can. I’ve ordered a few things through that store, and they do their best to be helpful. But I basically needed it last week or not at all. Having failed to get them I changed plans and started digging up the whole pipe. I’m going to the big town in eleven days, it’s got a Lowes and a Home Depot right across the street from one another. I’ll get a couple of flexible unions for storage when I’m there, and then I’ll have them for next time. But the sewer pipe will be long fixed before then. All PVC and ABS pipes grows and shrinks with temp…sorry its physics and its a fact. Likely it moves a lot since you aren’t buried that deep. You need to buy at least one expansion fitting, or expansion coupling, whatever your preferred term. Its a coupling that’s built to slide and allow for the expansion and contraction. It also allows a much easier way to put them together without having to dig it all up and slide the pipe back to make the glue connection.